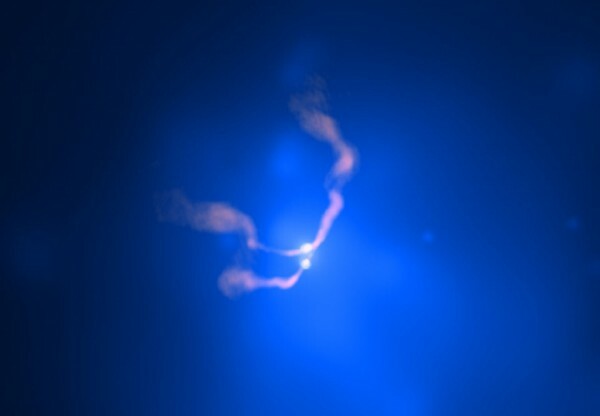 The cosmic dance of two black holes, that’s exactly the image you see. Obviously, a black hole is not seen as not reflecting light (we were all down except radiation Hacking, something by which black holes collapse and disappear, come with life cycle, as everything in this universe , something of the event horizon and the area of ​​mass changes over time as expelling and you silence me) but if you can see what is swallowing around … and in this case, is super gas hot that it emits X than two adjacent galaxies are supposed rays. These holes are in the galaxy 3C 75, and have been discovered and are being swallowed by the two nearby galaxies. They are so large that they are separated from each 25 thousand light years between them (remember that the nearest star is 4’5 light years and it seems that … an ocean with wooden canoes).Remember that the gas is spinning around the black hole … 1200 kilometers per second, and is what makes this very hot. In hundreds / thousands of years, when they collapse, it is expected to issue gravitational particles, gravitational waves and hopefully we are able to measure them. So you better learn and study in depth that causes serious way of measuring these causes. Copyright © 2019 Macadas, Tuti's blog. Powered by WordPress and Stargazer.